Nendoroid Morishima Haruka from Amagami SS was announced almost a year ago, and after being seen in prototype on the last WonFes, she is finally getting a preview photo session by Mikatan today. In any case, kindly visit Mikatan’s blog to view more pics of this adorable girl from Amagami SS. She will be available for pre-order starting tomorrow. Well, what do you think, Nendonesian? 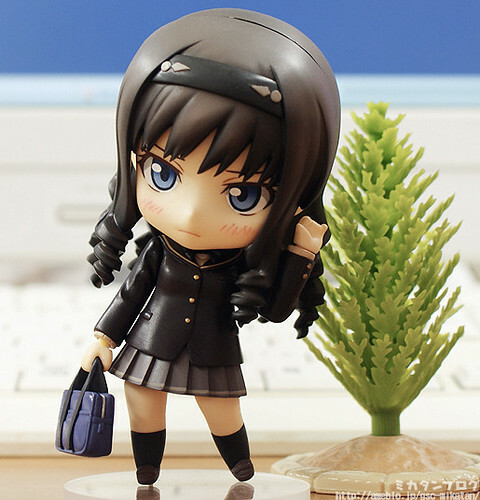 This entry was posted in News and tagged amagami, morishima haruka, nendoroid. I like her, but only a school bag and a few arms and legs? I would have liked to see some more accessoires.. Agreed. Her array of accessories are not that many. It should be fair that she is priced cheaper (perhaps 3000 Yen?). Flames over a toy, plastic, obsession over a drawn, fictional character. I would hope no one is that too far from reality to even be offended. As always, boring school girl with little accessories. Her hair is kinda cool but not enough to buy. I’m content with Homura, as they look pretty similar.